LOCATION – While the design/floor plan of your new home is important, the location of your home plays an equally important role in the process. 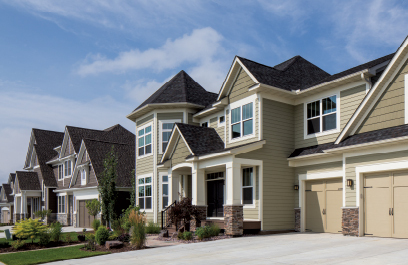 Most neighborhoods have select builders they allow to build in. Make sure you find a builder that is a good match for you and your new home needs before committing to a neighborhood. The location of your new home will have a big impact on your day-to-day life, so make sure you spend time doing your research. PROPERTY SIZE & PRIVACY – Do you want a property with acreage, or are you looking for something smaller? Answering this question will help narrow down your search for the perfect property. Keep in mind how much privacy you want when you are answering this question as well. The larger the property, the more privacy you will have. LOCAL AMENITIES – Think about your lifestyle. Drive around and make sure you are close to amenities you use most. These would include grocery stores, movie theaters, shopping/entertainment, and anything you spend your weekends doing! Finding a location that is close to all of your everyday needs will make your life much easier. TRAFFIC – Once you have narrowed down your neighborhood options, drive through your top choices at various times during the day, week and weekend to see what the traffic is like. Is it a quiet area? Is it right by a busy road or intersection? If you are someone who enjoys quiet and doesn’t want to hear traffic, this is something that can make or break a certain area. PROXIMITY TO WORK & FRIENDS/FAMILY – A majority of your time is spent at work or with your friends and family. Think about what the commute to work would be like from your top neighborhoods. Will you be stuck in traffic or will you be going against traffic? Think about the friends and family you spend a lot of time with. Will you still be in driving distance or will your time spent together become more of a destination event? These are important factors to prioritize when deciding what is most important for you. SCHOOLS – The quality of the local school system is a high priority for home buyers with school-age children. If you have a specific school district you want to be in, this will also help narrow down the neighborhood and property options for your new home. SAFETY – Everyone wants to feel safe in their home. Take a peek at the crime rates around your potential neighborhoods to see if there is anything of concern. The location of your new home will not only aid in the future value of your investment, but also your everyday life. It is important to think about your long-term needs and wants as well as short term. Make a list of must-haves and would-like-to haves. Drive through some of your top pick neighborhoods and take notes on what you like and don’t like. By asking the right questions and considering all of your options, you can find the perfect neighborhood to call home. If you are interested in living in the Twin Cities south metro, we are building in some great neighborhoods as well as on-your-lot. If you want to build custom and are looking for a property, let us help you! Contact us for more information about our process and how to get started on your new home!